Gov. 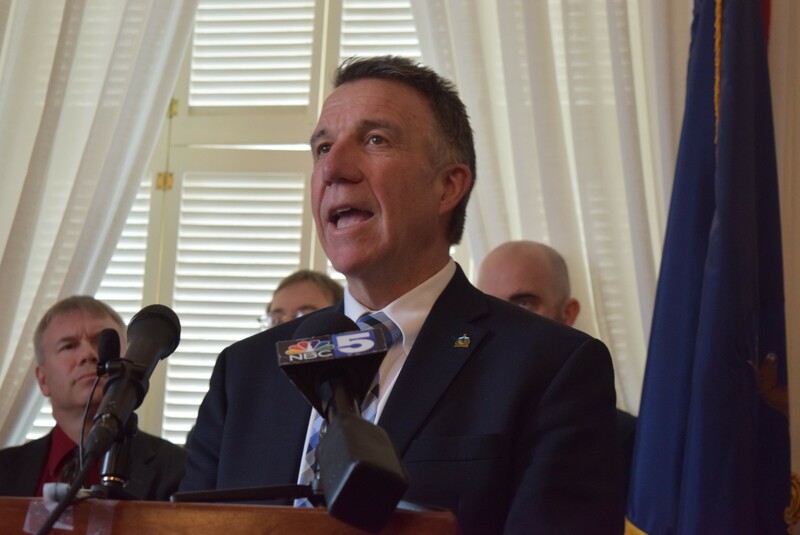 Phil Scott talks about teacher health care plans Tuesday at the Statehouse. With two weeks to go before the legislature adjourns for the year, political grandstanding and posturing reached new heights Tuesday inside the Vermont Statehouse. Here was the scene. At a press conference, Gov. Phil Scott urged the legislature to go along with a proposal that first surfaced just last Thursday. He wanted to negotiate a teacher health care plan on a statewide basis rather than school-district-by-school-district. It would save $26 million a year, said Scott, who wants that cash to spend on other state services. Health care plans for teachers across the state are all up for renewal this year, a rarity brought on by rules surrounding the Affordable Care Act. The new plans are expected to cost less, but how much less and how teachers and taxpayers share the burden remains a question. Standing with Scott at the press conference were several Vermont school board members and superintendents who argued that having the state negotiate one statewide health coverage plan with teacher unions is exactly what’s needed. “I would welcome this,” said Adrienne Raymond, a school board member from Shrewsbury who flanked the governor. She called negotiations between the laypeople who serve on school boards and the lawyers who represent teachers “skewed” heavily in teachers’ favor because of the complexity of health insurance plans. Scott proposed having his secretary of administration negotiate a statewide teacher health care plan. Legislative leaders, though, weren’t buying it. Scott waited nearly four months to offer up an idea that they said could violate labor laws. Senate President Pro Tempore Tim Ashe and Senate Appropriations Committee chair Jane Kitchel (D-Caledonia) discuss budget and tax issues. Why had he come forward with this plan so close to the end of the legislative session? Scott was asked. His explanation didn’t quite answer it. Hours after legislative leaders dismissed Scott’s plan as too much, too late, the Senate Finance Committee gathered to consider new proposals to raise revenue by shifting a greater share of the property tax burden onto wealthy Vermonters. The proposals were intended to mitigate the impact of a Senate Appropriations Committee plan for funding teachers’ pensions. That plan would use property taxes to pay for the pensions instead of using income taxes. While the committee debated plans that fiscal analyst Mark Perrault warned could not be enacted until fiscal year 2019, five members of the Scott administration sat in chairs ringing the room. One of them, Administration Secretary Susanne Young, said she had hoped to pitch the governor’s teacher health care plan to the committee. She left without doing so. Young said she was told the committee would not be taking any more testimony on education taxes. As she waited, that’s exactly what the committee discussed. 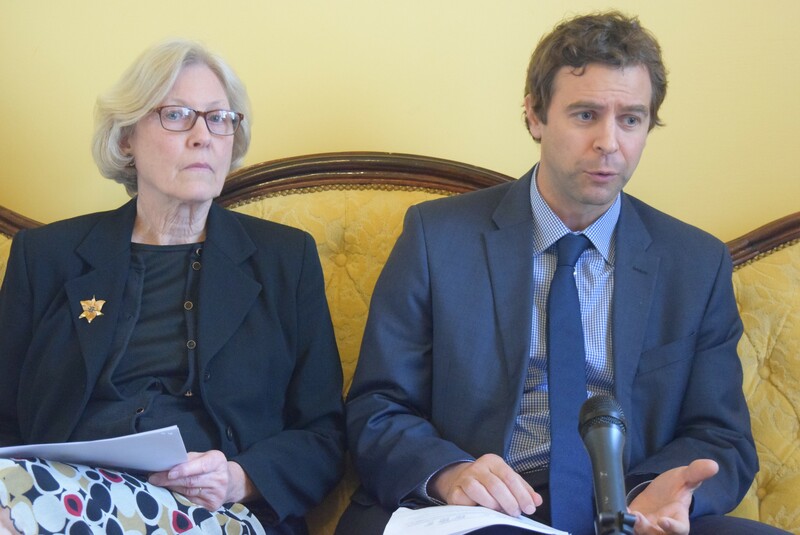 Sen. Anthony Pollina (P/D-Washington) offered a plan to ensure that higher-income Vermonters pay at least 2 percent of their income toward the education fund. That plan would raise $25 million, Pollina said. Sen. Dustin Degree (R-Franklin) piped up from his seat at the committee table. The governor’s plan would save $26 million, he said, offering it up as an amendment. “No, it’s too late!” chimed in committee chair Ann Cummings (D-Washington). Degree stood up and picked his suit jacket up off his chair. “I thought I was a senator and had the ability to amend a bill,” he said. “No,” Cummings replied, telling him he could offer his amendment later on the Senate floor. “Check the rules,” Degree fired back as he stormed out of the room.